My creative inspiration comes from observing the plants and animals that live in urban environments. I transform images that I see and that I take with my camera into detailed drawings that eventually become illustrative silhouettes of places and objects. Trained as a biologist and growing up in rural New England led to the development of my interest in exploring nature and our relationship to it, emphasizing the incongruities that arise at the interface between nature and the urban society that permeates it. I incorporate into my work a variety of biological themes such as adaptation, evolution, and how humans and animals interact with each other and with the environment. My first career was in biological research where I spent long hours dissecting tiny insects under a microscope using handmade dissection tools. Now when I do my artwork, the process of progressively cutting away the paper to release the image reminds me of the dissection process. 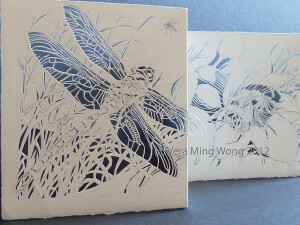 The images are cut from one piece of black paper using only an x-acto knife and must be simplified and arranged so that each element fits together like a puzzle, with each piece retaining a connection to the whole. Vera Ming Wong draws life from nature. Her drawings, watercolors, and cut paper creations, featuring native plants, animals, habitats, and ecosystems, reflect her interests, background and education in biology (Swarthmore College, PA) as well as art (Univ of Minnesota). As a natural science illustrator, she collaborates with writers or editors to show biological diversity, relationships or processes of native plants, animals and fungi. As an artist, she strives to bring wildness into galleries, and reveal under-recognized natural wonders through intriguing 2- and 3-dimensional forms and images. As an educator, she combines art techniques with biological exploration to help students both discover and express their own insights. In all her realms of endeavor, Vera aims to illuminate the intrinsic value and ecological importance of native species; to incite curiosity in viewers and participants; and to inspire them to explore and respect nature wherever they are. 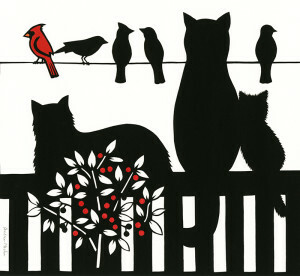 Vera’s illustrations appear in numerous books and magazines, including Minnesota’s Endangered Flora & Fauna; North Woods Wildlife: A Watcher’s Guide to Habitats; Orchids of Minnesota, North Shore, Minnesota’ Superior Coast; and Minnesota DNR’s Minnesota Conservation Volunteer Magazine. Vera exhibits primarily with Project Art for Nature, a consortium of artists committed to inspiring conservation of nature through art, which she founded in 2001 and continues to lead. She is also a member of Guild of Natural Science Illustrators; the artists’ group What We Need Is Here; and Guild of American Papercutters.